It seems like only yesterday that edamame was an exotic treat that I could only find in Japanese restaurants, and now my local A&P is carrying it in giant bags in the freezer section. Which is a wonderful thing, because instead of only being able to nosh on it when we go out for sushi, now I can make things like edamame pesto, which is a creamy, dreamy, slightly gentler version of the basil pesto we all know and love. And just as easy to whirl up in 60 seconds or less in your food processor. 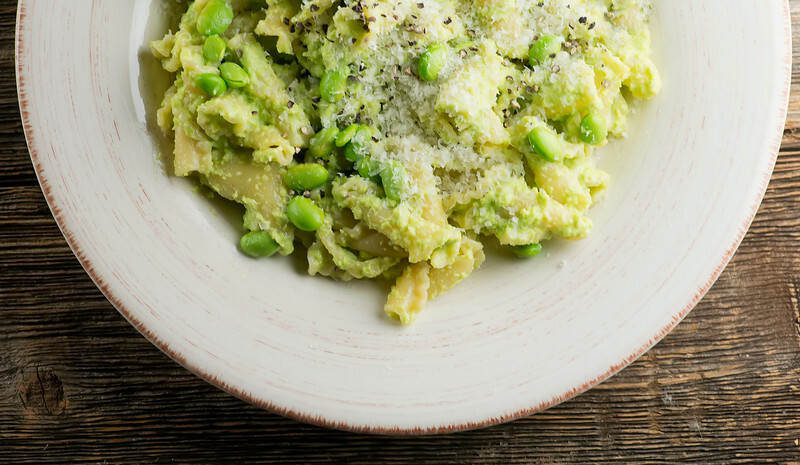 If you haven’t yet discovered the deliciousness that is edamame, come along with me…and if you have, still come along because I am going to show you how to make it into pesto! Edamame is basically soybeans in the shell. And steamed edamame in the shell with a little sea salt is still and always will be one of my favorite snacks EVER…you bite down on the soft shell and the beans pop out and yum. Yum. Good and good for you and yum. Edamame pesto involves taking a cup full of the shelled beans and whirling them around in your food processor with some garlic, some parmesan cheese, a little olive oil and some salt. Because the edamame has more texture than basil leaves, I thin it out with a little pasta water to make it more sauce-like…and that’s it! All that’s left is to toss it with some hot pasta, top it with a little extra parmesan cheese, a few whole edamame beans and some cracked pepper, and you are in business. So while I fully intend to have a summer filled with basil pesto-infused suppers, when I want a gentler, more substantial pesto, I’m turning to that big bag of shelled edamame in my freezer. The more pesto options the better! 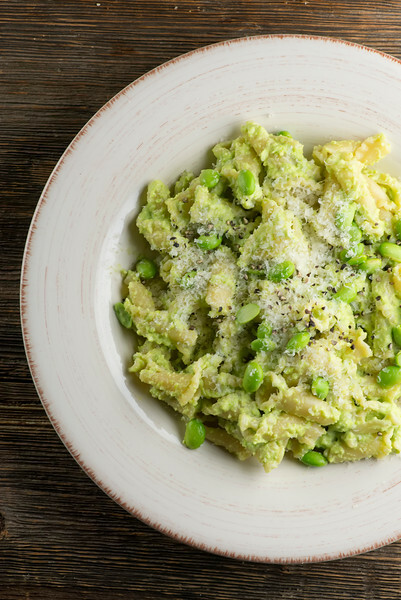 Try edamame pesto for a gentler version of the classic basil version. Cook pasta according to package directions. Scoop out a cup of pasta water before draining. Place garlic, edamame, parmesan, olive oil and salt in food processor and process until smooth. Thin with pasta water until it is the consistency of a thick sauce. Add pesto to pasta and toss. Serve garnished with some edamame and fresh pepper, and even a little more parmesan if you like! This looks delicious! What a great idea – fresh and so tasty for summer!!! I like that you switched it up, this sounds great! Love edamame; LOVE pesto – this looks so great…thanks for sharing! Ohhhh my goodness. I’m a pesto NUT (har har…) and can’t wait to try this! Visiting from Blogher–this looks delish! I love edamame and the pretty light spring green makes this peso look so perfect for summer! Thanks Jennifer! It’s definitely going to make multiple appearances on my summer supper table. edamame is just the bomb diggity, and this is a fabulous way to consume it!! The bomb diggity! I love that! Can I borrow it? This looks amazing! I love edamame. It’s the BEST snack, right? Which means we can have it both before and during dinner! I love edamame but would have never thought of it in pesto. What a great idea! I love ideas for alternative pestos. I bet this is super creamy and delicious. I love finding new plays on pesto! ANd have yet to try edamame in place of basil. Sounds tasty! I just KNEW you would like this one, my friend! Thanks Mindy and yay for pesto!